"Training-wise, I ran 140 miles a week all the time - sometimes more. Back then it was kind of a prerequisite if you wanted to be good you had to run a lot of miles. And it's not just how many miles you run, it's how you run them, and I ran a lot of them hard. I probably wasn't sharpening very well. I wasn't good at adding in the track work and the sharpening work. That was probably my shortcoming. I really believed in the high-mileage and hard mileage. But after our era, you started hearing coaches and athletes talking about running 80 miles a week. And my thought about that was that just wasn't maximizing the machine. I think at some point, maybe people were trying to finesse things away from high mileage, but now you're hearing more people talk about being on high-mileage programs again." - Mark Nenow, the man who set the American record in the 10,000 of 27:20 in 1986 - the 25-lap record, 25 years ago (we meant to put this up on Sept. 5 but forgot that was the actual anniversary) - talking in a great Running Times piece on him. 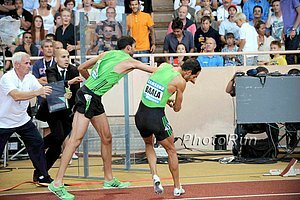 What did Farah do under Salazar to become so fast in the final lap? *Judge Kicks King Carl (Lewis) Of NJ Ballot He says that just because he's famous doesn't mean he doesn't have to follow the rules. * "Marathon Mom" Jenny Finch Now Has Big Goal Of Beating Armani Toomer's Time (4:13) At ING New York City Marathon The guys at photo run will certainly be happy to take her photo. *Runners Tribe Guy Asks If Good Racing Tactics Can Be Taught "Running from the front requires more energy. But then again, so does catching up to the leader." We're not sure why the article is full of praise for Bernard Lagat's tactics. One could easily argue tactics cost him gold in Daegu. Kenyan Coach Critical Of 10,000 And 5,000 Performances He blames lack of finishing speed and doing too many road races. 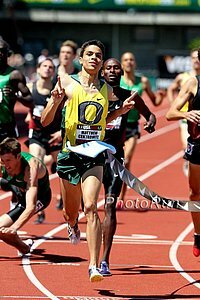 Extended Article On The Career Of Matt Centrowitz, From High School To World Champs Bronze Medallist "This whole year's been about having fun. I can't think of one race where I put so much pressure on myself. I knew if I was dead last I'd still be 12th in the world. That's not so bad." 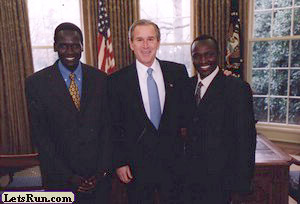 Seb Coe Calls Bolt "Muhammad Ali Of Athletics"
After Winning 2nd World Title, Abek Kirui Immediately Starts Dreaming Of ... A Promotion In The Kenyan Army He deserves it for going to Worlds. Japanese Men's Marathoners Post-Race Quotes After Winning Team Bronze Medal A 7th, 10th and 18th somehow was good enough for 3rd as some other countries screwed up. 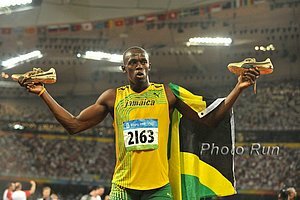 *AP Column: Is Usain Bolt trying hard enough? *Seb Coe's 7 To Watch For 2012 Dwight Phillips is the only American on the list. In Case You Missed It IAAF Head: "No Chance" The False-Start Rule Changes The rule was the personal pet project of the IAAF head and will stay thankfully. Caster Semenya Is Back And May Be Saving Best For Final Good read from the Guardian. Michael Johnson Says Oscar Pistorius Should Have Run Independent One possibility is S. Africa left him off the final because they got his split wrong. Pistorius Left Off 4 X 400 Team Because Of Inaccurate Splits? Pistorius "Guttered" At 4 X 4 Snub Blade Runner grateful for semifinal appearance, 4 x 4 national record and now a silver medal. LRC In Daegu: American Glory, Evil Sorcery Jinx Rule Day 6 In Daegu World champ and new US record-setter Lashinda Demus and her mother/coach talk about how video games brought her to glory, Jesse Williams wins the first US high jump gold in 20 years and throws a barb at Dwight Stones, and the biggest news of all: The *LRC Exclusive Report* that may change betting lines around the globe - The Dastardly Daegu Daily Programme Cover Jinx. Caution: content may not be humorous to all track fans. If Only Things Worked Like This In America - GBR, Will You Take The USA Back Please? Sports Illustrated Lavishes Praise On LetsRun.com And Rojo Tim Layden: "According to the smart guys at letsrun.com ..." & "I have great respect for Johnson"... but more respect for Ato Boldon ;(. LRC MB: Tim Layden Refers To "The Smart Guys At Letsrun.com"
Roll Tide: 18-Year-Old Wunderkind Kirani James Adds World Crown To Two NCAA Titles Afterwards, he declares, "(Usain Bolt) he can't be Kirani James." Watch out or he'll move up to the 400. *Brit Dai Greene Might Be Poised For World 400H Title He had the 2nd fastest qualifying time for the final. *Isinbayeva Fails To Medal As Well - Is The Latest Victim Of The IAAF Cover Curse If you show up on the cover, you are doomed. *Robles: "Being Cuban cost me hurdles gold medal." *Poor Javelin Hurts Ennis Some are saying it "cost" her the title, but in reality, she'd have had to get a PR to win. 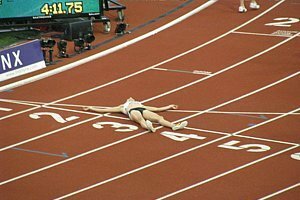 *American 400m Running At A Low Point? Bekele Pulls Out Of Men's 5,000 Jos Hermens his agent calls Daegu a "wake-up call" for Bekele, who may run in Brussels on Sept. 16. LRC One-Line Preview Of The 2011 Zürich Diamond League Meet It's hard to believe the Diamond League recommences on Wednesday, but there is some interesting action besides the men's 100. In the men's 1,500, Asbel Kiprop will be racing the clock, Silas Kiplagat and 800 specialists Nick Symmonds and Abubaker Kaki. In the women's 800, Morgan Uceny will look to get over her Worlds fall, but she'll have her hands full, as she'll clash with both the world champ Mariya Savinova and Caster Semenya. *IAAF Preview: 19 Gold, 18 Silver And 15 Bronze Medallists From Daegu Will Compete, As Will Asafa Powell Powell will pick up $40,000 for winning the Diamond League - ridiculous. *Powell Talks Big At Press Conference: "I don't know what shape I'm in right now but I got a good feeling." Meanwhile, Yohan Blake reminds everyone he's the world champ. *The Science Of Sport's Guys Analyze Semenya's Loss If she received hormone treatment, then how is she within a second of her Berlin time? *Asbel Kiprop's Says Now That He's World Champion He's Sticking With 1,500 Even If He Doesn't PR Earlier in the year, he said he'd change events if he didn't PR. Now he's focused on finishing the season strong and how crazy is this - running fast early next year to make sure he's on the Kenyan Olympic team. *Asafa Powell Will Clash With Men's 100m Champ Yohan Blake On Wednesday In Zürich The former world record holder was too injured to run in Daegu, but he's not not injured enough to try to pick up a big payday on Wednesday. Not familiar with "Saving Yourself For Zürich I?" Take a look at this entry from way back in the early days of LRC - 2001. Preview Of Berlin Internationales Stadionfest This Sunday World Champ Yohan Blake vs. 4 x 1 teammate Michael Frater in the 100m, Caster Semenya vs. bronze medallist JJ Busienei of Kenya in the 800. Top UK Runners Jo Pavey And Mara Yamauchi To Race At Bupa Great North Run On Sept. 18th Both are coming off of injuries which kept them out of the World Championships. Canadian Olympic 10k Runner Eric Gillis Enjoying Training For Olympic Marathon "A" With Rivals "I will enjoy the process more, which inevitably is what it's all about, if I am training with the guys like Reid and Rob, than if I was training on my own. It's going to lead to better results down the road. It really works on a number of fronts to benefit me. I am not worried about side effects of helping them out. I am quite happy to do that." Sarah Palin Runs An Iowa Half Marathon In 1:46:10 Faster than Drew Carey, who ran a personal best 1:50:45 in the Disney Lane Half Marathon. *MB: Palin run Half Marathon?????????? Greek Appeals Court Overturns Convictions For Former Sprint Stars Costas Kenteris And Katerina Thanou We disagree 100% with their lawyer's assessment of what this all means. Their lawyer says, "I am proud as a Greek, because the decision demonstrates that the [athletes] were totally clean." No it doesn't. It just means they couldn't be criminally convicted of perjury or staging a crash. The conviction of their coach for "on charges of possession and storage of illegal substances" was upheld and the facts are that Kenteris and Thanou did miss three drug tests in 2004 - only one of which was for the alleged car crash. He's Back? Abdi Abdirahman Takes Lead At 3 Miles, Never Looks Back And Easily Wins The times were slow, as Abdi (60:12) kept looking over his shoulder wondering where the competition was. In the past, sub-61:00 hasn't even placed in the top 10, but today only three broke 61:00. 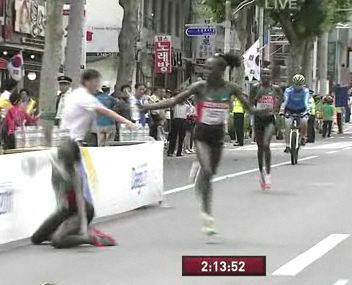 In the women's race, newly-minted US citizen Janet Cherobon-Bawcom, formerly of Kenya, won in 68:31. *Running USA Recap With Top 10 Result *LRC MB US 20k Champs *LRC MB: Abdi is Back!!! *Philip Hersh: The US Cleans Up In The Medal Counts At Worlds; Allyson Felix Walks Away With 4 Medals After Helping The Women's 4 X 1 Win Gold Allyson Felix is only the 4th athlete ever to win 4 medals at the World Championships. *Russian Tatyana Lysenko Upset WR Holder Betty Heidler To Win Women's Hammer But she's a former drug cheat who was involved in Russia's largest doping scandal. *At The Beginning Of Last Month, Ciaran O'Lionard Hadn't Run Under 3:40, Now He's Finished 10th In The World Article talks about how he'll now be getting funding from Ireland Sports Council and how he had to spend 2 hours in anti-doping because he "couldn't produce a sample" due to dehydration. *Despite Success, UK Coach Charles van Commenee Still Very Critical Of His Team He describes the performance of the men's 4 x 400m in their final as "appalling, unforgivable." 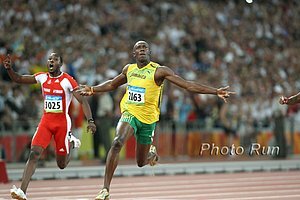 *Of False Start In 100m, Bolt Says, "It was all my fault. People are saying that Yohan twitched, but that is not the case." NY Times: In Span Of 30 Minutes, US Wins 3 Golds Jesse Williams got the US's first high jump gold since 1991. Two Athletes From Africa Allegedly Molest Volunteers In Athletes Village The sickest part is they told them they wanted to greet the women in the customary way of their homeland. Recommended, But Painful To Watch: Watch Michael Johnson's Sidekick On British TV Butcher Lines Before Getting Fired Catch it while you can. Channel 4 had it taken off of YouTube. LRC: Men's 5,000 Round 1 Bernard Lagat, Galen Rupp And The Expected Favorites Advance, Plus Alistair Cragg And Jake Robertson A good day for all the favorites, as they advanced - including Bernard Lagat and Galen Rupp. Plus, LRC cult hero Jake Robertson got knocked down and out of the final and made no excuses before the Kiwis petitioned and got him into the final. LRC: Women's 800m Underway: Favorites And Americans Alysia Montano, Maggie Vessey And Alice Schmidt Advance Good day for the American women. Recap, reaction and results. Go Find A McDonald's: Jamaicans Complain About Food In Athletes' Village Jermaine Gonzalez ripped the food after getting fourth in the 400. RR: Tim Layden Of SI On Jason Richardson, John Smith And Carmelita Jeter Good read and some good quotes. Smith: "I've been at the track coaching athletes with the FBI watching me." Wheating: "It felt like a big golf ball was shoved up into my hamstring." RR: 2000 Olympic 5k Champ Million Wolde Is Impressed By Jeilan's Victory But Says That Bekele Came Back As A Champion After World XC Dropout And Can Do So Again He also admits he wasn't sure Farah was beatable. Limited state of Emergency Declared Ok this already existed but it's interesting. We Don't Agree: IAAF Compares Kirani James To Usain Bolt Personality-wise? It's not even close, but we love the true King James that actually produces in the clutch. Tuesday's AM Action: LRC: Men's 1,500: Wheating Out, Most All Favorites Through In Men's 1,500 First Round Andrew Wheating's difficult 2011 campaign likely came to an end with a first round exit in the 1,500 heats. The heats saw wire-to-wire running from a resurgant Dan Komen, a fall for Mehdi Baala, and Centro Jr looking good and Leo Manzano struggling but advancing on time. Women's 5,000: Women's 5,000m Semis: Molly Huddle Goes Home, Meseret Defar And Linet Masai Both Run 2/3 of the fields advanced and the American record holder Huddle did not advance, which was not a surprise considering her injury. LRC: 2011 Worlds Steeplechase Prelims: Favorites Advance And Americans Struggle Ezekiel Kemboi blasted an 8:10 steeple to lead the qualifiers as the American men bombed. Plus some interesting comments from Dan Huling: "I'm embarrassed, disappointed, a little bit relieved." False Start Rule - Fair Or Foul?